This is where I hang on as tight as I can. I think this is my most favorite shot of yours. love it! Gorgeous capture. I'm holding on tight, too. Yes, quite likely my most favorite shot of yours also. This one will win awards. Love this so much! It really tells of how people can things so differently. gorgeous!! as I said on flickr - this is stunning. one of the most perfect shots I've ever seen. That shot is amazing and the quote matches so well. I like this one, very encouraging. So, thank you. that's gorgeous! it's really true how the same image can mean both good and bad. this shot is amazing and the quote fits it so well. i'm a little uneasy just looking at that shot - but crossing that bridge is likely worth it! That was during dollar days at Grandfather Mtn. I felt so bad for that out-of-town couple that came to see the views and paid full price. They may have been standing on the "Mile High" bridge, but aside from the handrail, you couldn't tell it from the parking lot. Oh my goodness, this picture took my breath away. Spectacular image and the perfect quote! Do you see a glass half full or a glass half empty? No such thing has half empty in my books. This is a wonderful photo to display exactly that. The photo is haunting and breathtaking, however your post content is disturbing... are you ok sweetie?? Wow. I want a print. Amazing. You never fail to move me when I come here. Beautiful photo! And a belated thanks for the Living Green book. I'm learning so much from it. My, you left me speechless... you can make a horrible weather looks this beautiful! "When you have reached the end of your rope, tie a knot and hold on tight"
I love the fog so I see a beautiful shot. WOW...this is a really great shot. 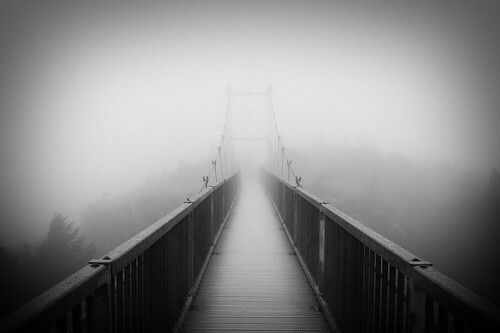 The softness and the mist around the bridge really makes it endless and lonely. Beautiful, beautiful image....did you take that? i love your quote and great photo as well.